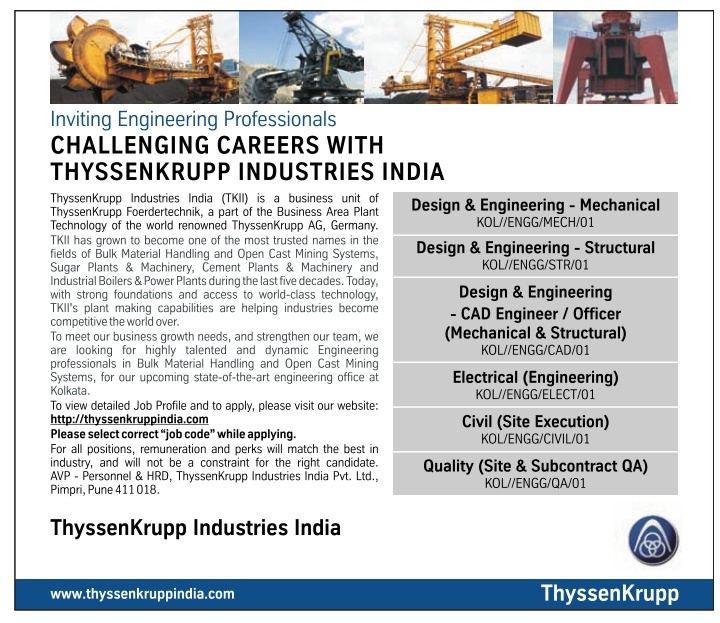 ThyssenKrupp Industries India (TKII) is a business unit of ThyssenKrupp Foerdertechnik, a part of the Business Area Plant Technology of the world renowned ThyssenKrupp AG, Germany. TKII has grown to become one of the most trusted names in the fields of Bulk Material Handling and Open Cast Mining Systems, Sugar Plants & Machinery, Cement Plants & Machinery and Industrial Boilers & Power Plants during the last five decades. Today, with strong foundations and access to world-class technology, TKII's plant making capabilities are helping industries become competitive the world over. To meet our business growth needs, and strengthen our team, we are looking for highly talented and dynamic Engineering professionals in Bulk Material Handling and Open Cast Mining Systems, for our upcoming state-of-the-art engineering office at Kolkata.